Reptiles are usually thought of as cold-blooded (an outdated term), simple animals that certainly don't care for their young. Behaviours such as family living and parental care are usually not associated with snakes, and are only associated with mammals and birds. However, this may be more as a result of the lack of research on reptiles, than as a result of their actual behaviour. 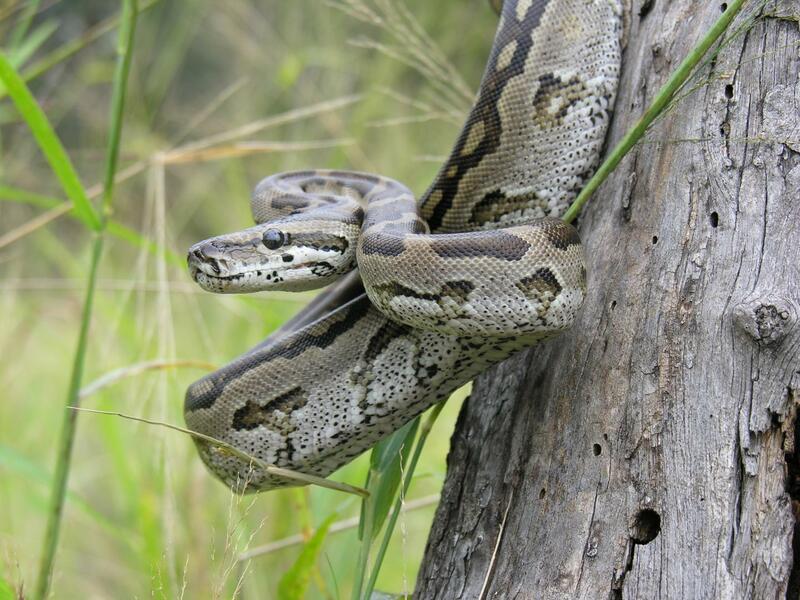 A recent study by Professor Graham Alexander from the Alexander Herp Lab at the Wits School of Animal Plant and Environmental Sciences has found that female southern African pythons not only incubate their eggs, but they also stay at the nest, caring for their babies for about two weeks after the eggs have hatched. During this time, the babies spend the nights protected and warmed in their mother's coils, secure in the nest chamber. "This is the first-ever report of maternal care of babies in an egg-laying snake," says Alexander, whose findings are based on seven years of intensive fieldwork at the Dinokeng Game Reserve, just north of Pretoria. During this time, he tracked 37 pythons through the use of radio transmitters. These results, and other surprising discoveries were recently published in the Journal of Zoology (London). During the study, eight of the radio-tracked pythons laid eggs in aardvark burrows, and Alexander recorded their breeding behaviour using infrared video cameras carefully lowered into the nest chambers. "I was amazed by the complex reproductive biology of this iconic snake," said Alexander. The female python's protective behaviour towards her offspring comes at great cost to themselves. The females do not eat at all during the breeding cycle – a period of more than six months – and lose about 40% of their body mass over this time. The females also turn black when breeding – a process which Alexander has termed 'facultative melanism' – an adaptation that probably increases rates of heating while basking in the sunlight. "Efficient basking is probably crucial for incubation. Unlike some other python species, southern African pythons are unable to warm their eggs by elevating their metabolism. Instead, our pythons bask near to the burrow entrance until their body temperature is almost 40 °C (within a few degrees of lethal temperatures), and they then coil around the eggs to warm them with their sun-derived body heat." The body temperatures of receptive, pregnant and brooding females in the study were more than 5 °C warmer than non-reproductive females. Even the body temperatures of baby-attending mothers were significantly higher than non-breeding females. "All of this takes its toll on mother pythons: they take a long time to recover after breeding and so can only produce a clutch every second or third year, depending on how many meals they are able to catch in the months after leaving the nest. Some of them never recover." Alexander's team have recorded instances of females breeding of starvation after breeding. "Perhaps they just became too weakened to catch food," says Alexander. Fortunately all the animals tracked during the study survived, but none of them bred in the following year. Another surprising finding in the study was the fact that the male pythons followed receptive females around for months. "In one case, one male was recorded following a female for more than 2 km over a three-month period," says Alexander. Alexander's findings suggest that we still have lots to learn about the reproductive biology of snakes. "Research is showing that snake reproductive biology is far more complex and sophisticated than we previously thought, and there is a range of behaviours that have been recorded in several species that can be classed as maternal care. For example, biologists are discovering that females of many types of rattlesnakes show maternal care of babies. In some species, mothers appear to even cooperate by taking shifts to look after young. But all these species are live bearing – our python is the first egg laying species that has been shown to care for its babies."